Being a superhero is very hard work, especially when you’re only 3 and 4 years old! 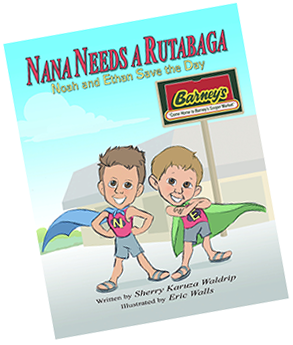 All the boys wanted to do was help their Nana get a rutabaga and pick out the ice cream for dessert. What could go wrong? Plenty, when you inadvertently let a naughty little monkey escape from a box of Animal Crackers. The boys knew it was up to them. They had to capture the monkey and get him back in the box to save the day, before grown-ups get hurt! Learn how to purchase Nana Needs a Rutabaga.